Complete filters along with Cartridge Replacement filters for your Sundance® Spas and Jacuzzi® Spas. Not sure of which filter you need? Click on our Link below for the Filter Chart that help you find the right replacement filter for your spa. Spa Filters and Replacement Cartridge Filters and Components used on various Spa Manufacturers including: Hayward, Jacuzzi, Pentair, Rainbow Plastics, Waterway. 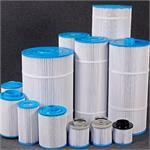 We carry Sundance Replacement Cartridge filters for your Sundance Spa, Jacuzzi Spa and other spa brands. Check in this section for the filter for your Sundance Spa.